Many people experiment with ceremonial magic under the mistaken impression that the beings evoked are not part of objective reality and therefore cannot harm them. Far too many paranormal teams walk blindly into investigations where the real power of ritual and dark magic has been practiced openly or concealed. Here's some of those "not objectively real" beings you might encounter when this is taken for granted! In Yatukan sorcery Akoman, or Ako-Manah, is the most powerful of all Deava in service to the Adversary, Angra-Mainyu (Ahriman). He is the demon that inspires the evil sorcerous mind. He has no material form but when evoked manifests as a shadowy flame lit from within with a baneful light, the very black thought itself. Akoman is the demon of cursing, attacking, and destroying enemies through nightmares and attacks upon the subconscious mind of the target. A harmful, defensive shadow when used in extreme circumstances, Akoman also represents deviation from the natural order. 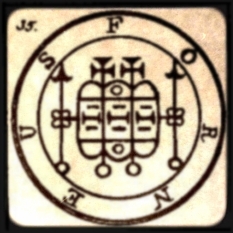 One of the seven Arch Demons of Yatukan sorcery, and syncretized with Belial in the Western Magical Tradition, Akoman is symbolized as an open hand fixed with a penetrating eye representing the dark depth of the internal mind. Essential as a manifestation of darkness made flesh, Akoman is NOT to be evoked casually or without a good and justifiable reason. Alloces is the 52nd Spirit of Solomon, appearing as a Duke in military garb riding upon a great war-horse. His face can be frightening to behold and his voice is like thunder, but he will willingly instruct the magician in the many scientific arts; Alloces can also provide familiars to help guide the magician along the initiatory path. Alloces rules over 36 legions and, if properly evoked and propitiated, may be used to cause harm to the enemies of the magician particularly by causing bouts of paranoia to afflict these enemies, according to the phases of the moon. This last aspect connects Alloces in a very direct manner with other powerful demons governing the affliction of lycanthropy. The Devourer, the Werewolf Demon, Amon is a significant force whether invoked – as through prayer or propitiation – or evoked into a material state in which he becomes Darkness Incarnate. Amon is said to appear with the head and forearms of a ravenous wolf vomiting flames and blood with the lower half that of a coiling dragon. Sometimes, when evoked, he will appear with the head of a raven upon a human form. A spirit of divination and manifestation of Will, Amon can bring 40 legions of spirits for the sorcerer to use in vengeance or attack. 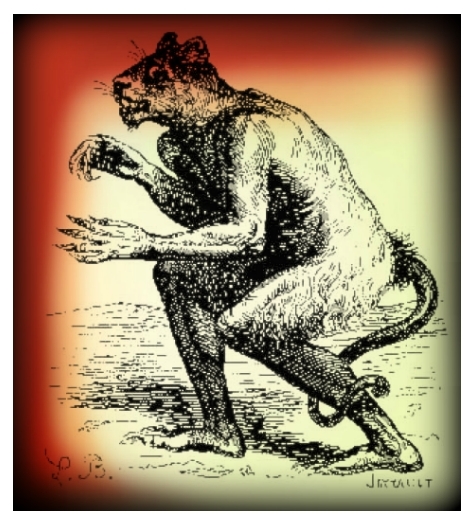 In Hebrew lore, Azazel id the “Scape-Goat” of the Jewish people; once a year they would take a goat, name it Azazel, and upon it cast all their sins of the previous year before releasing it into the unforgiving desert as a sacrifice. 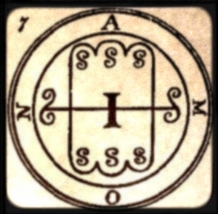 In reality a fire demon, Azazel is a guardian Spirit of the Watchtower of the South and is considered one of the greatest Fire Djinns of Islamic Sufism. Azazel inspires, and is inspired by, the expression of the sexual drive. Barbatos is a spirit of the astral plane where he inspires those on the path of initiation. He communicates through animal-like posturing and animal sounds such as growls, whines, howls, etc. Barbatos guides the initiate in the way of shape-shifting. Once an angelic ruler, he now commands thirty legions of the fallen. A mighty and terrible King governing 85 legions, Beleth manifests on a deathly-white horse accompanied by a fanfare of trumpets announcing his arrival. He appears covered in flames, but the flames do not consume him, and the magician will find it necessary to constrain Beleth to take on a less frightening form. Once he complies with this request, Beleth takes on the aspect of a mature king of the Order of Powers. Beleth is most often called upon to assist in spells that work for the satisfaction of the magician’s lust and sexual desire. Caim is a bird-like demon who, when summoned, will often take on the form of a man armed as if for battle, carrying a broadsword. In the days after the evocation of Caim one will notice an increase in the number of birds nearby and these birds will always generate an inordinate fear in children who may encounter them. Caimis sought through divination with ash and fire. He teaches travel through the astral plane, shape-shifting, and “dream flying.” Caim also understands and can teach the language of birds and some other animals. Once an angel but now bound to the etheric plane nearest the earth sphere, Caim teaches great knowledge of the earth and exerts command over earthly elementals. In the spirit realm, Caim commands thirty legions of infernal spirits. Forneus is a Marquis among the Spirits of Solomon who appears as a sea monster or sea dragon. One of the vanguard of Leviathan, Forneus brings wisdom and the mastery of languages, especially forgotten tongues of old. Forneus can cause agreements and reconciliation between enemies. He was once of the order of the Thrones Angelic and hence governs 29 legions of like spirits. Forneus may be invoked in a bestial form or as the serpent of self-awareness. Forneus may act as a spirit guide for the magician as he plumbs the depths of his lowest consciousness. 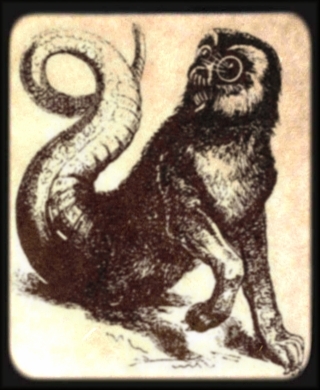 Flauros, sometimes Hauros or Haures, is Solomon’s 64th Spirit and when evoked appears as a vicious, aggressive leopard which must be immediately constrained by the Will of the magician and commanded to take on human form. This done, Flauros will appear as a large, intimidating black shadow with flaming red eyes. Flauros is a spirit of divination given power to see the future and explain matters of the past. He will instruct the magician in the lore of the Fallen and the origins of Creation, and he will burn and destroy the enemies of the magician if this is desired. But be warned: Flauros is a mighty and ancient spirit and submits to the command of humankind grudgingly. Under no circumstances must the magician attempt to evoke this Being without the protection of the circle and a warded triangle of manifestation. If given the chance, Flauros will uproot the will of the sorcerer and take hold of his mind, planting there all forms of madness and manifesting all manner of negativity in the sorcerer’s life. Flauros commands – and will use – 36 legions of spirits. Gramori, also Gremory, is the 56th Spirit of Solomon and a ranking Duke. Gamori appears in the form of a beautiful woman of Middle Eastern aspect wearing a crown and rich garments and riding upon a camel. A divination spirit and very powerful, Gamori can also be induced to copulate with the magician in a dreaming state. Gamori can tell of things past and present and aid in the discovering of hidden treasures (not always of the material kind), but the future is generally concealed to her. Gamori is also useful in the conjuring of lust in women. A powerful spirit, Gamori governs 26 legions. 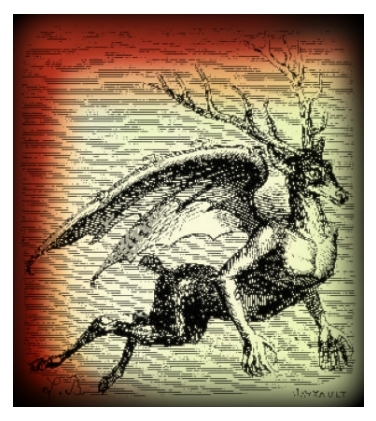 Halphas is the 38th Demon of Solomon who appears alternately as a winged creature or as an aged man with a beard of writhing, worm-like tendrils. Halphas has the power to build towers and fortifications around the magician that summons him in order to protect that magician from evil intent or assault by other magi. Halphas commands 26 legions of demons from which he will send members to occupy and fortify the astral towers providing even further protection of the commanding magus. Halphas strengthens the mind of the magician making it just as impenetrable as the astral towers. Halphas should not be evoked casually or disrespectfully; in this event he is a formidable agent of destruction and will pull his towers down upon the magician, burying him eternally in the Abyss. The name “Ma’hazael” comes from the root “MhZal” which means “to devour or consume.” Mahazael is a guardian Spirit of the Watchtower of the North and is associated with the earth, death, and Cain the Son of the Earth, and sometimes serves the Grand Demon Amaimon. Mahazael is drawn to all workings with the Northern Watchtower and commands many legions of earth elementals. In Persian-Yatukan sorcery Nasu, sometimes Druj Nas, is the spirit of the corpse and dead matter, of catatonic unconsciousness and zombification. Often compared to Beelzebub in his aspect of Lord of the Flies, Nasu rules contamination, decomposition, and defilement. He is the Yatukan demon of necromancy and conversation with the dead and facilitates divination with the aid of the dead. Nasu sometimes appears in female form with an insect-like head and a body composed of rotting flesh; in this aspect she compares to Lilith-Az or Hecate, Queen of Ghouls. Part of her invocation requires the mixture of earth matter such as graveyard dirt, compost or loam, with naturally discarded (i.e., not deliberately obtained) discarded material from the human body such as hair, spittle, tears, urine, or feces. This powerful Persian demon should be greatly feared. In Persian-Yatukan sorcery Savar is the powerful leader of all the Daevas. Savar can be compared to the demon lord Belial of the Western Magical Tradition. A Lord of Chaos, Savar is central in the conjuring of storms on the astral and material planes, forcing change to manifest in material reality. Savar is most useful if one is under attack by a magical opponent or other demonic entity. Extreme caution must be used in the conjuring of Savar as his manifestation in physical reality causes extreme chaos and discord to occur. Savar moves constantly through the shadowland of the etheric realm and this keeps him very close to the material sphere, thus Savar usually responds quickly to magical evocations and is ever-ready to assist the magician’s work. In the Magian tradition, Sej is a malicious demon evoked specifically for the annihilation of the enemies of the sorcerer. It is said that Sej “forces the hand willingly” and causes the targeted enemy to design and conceive their own demise through the influence of their own thoughts and fears, rather than directly causing it. Manipulation at the hands of this demon can continue for years, if it is the intent of the magician. From the root ShTN, meaning “Adversary,” this “Goat With One Thousand Names” has become, perhaps unfairly, forever linked with the personification of evil in the dogma of Christianity. Originally among the highest-ranking of the angels, seated in the presence of the throne of the I Am, Satan, also called Ha-Satan by the Jews, was assigned the unpleasant taste to prosecute mankind before the Hebrew God. In fulfillment of his taste, Satan became reviled as the Opposer, the Accuser, the Tempter – truly “anti” God, and ultimately “anti” Christ. Satan rules from the South, the Kingdom of Fire and the Noon-Day Sun. Legions upon legions of angels who followed him into discord remain at his command. More a god than a demon, Set cannot be given justice in a brief overview. However, some facts about him may help in understanding or inspire further study in the initiate. Set is the Egyptian ruler of Chaos and Storms; he is known by many names such as Seth-an and Set-heh, among others. Originally a positive force, later in Egyptian lore Set became the embodiment of the Opposer in a role that can be compared to that assigned the Christian Devil. Lord of the Northern Sky, ruler of storms, cold weather, and darkness, it was natural to associate Set with death and the mysteries of the unknown, both shadow and fire. In juxtaposition to his power over cold and darkness, Set also held dominion over the scorching desert where he could devour or save mankind according to his whim. Set was associated with all forms of unrest and discord and was ultimately cast as the adversary after he murdered the god Osiris. Because of this, Set is in everlasting opposition to Isis, the consort of Osiris, and all those who worship her. Set is described as a serpent-like demon, reminiscent of Apep, the snake of the great Abyss. He is accorded power similar to that associated with the Cthonic Titans of Greece and is the patron spirit of sorcery and magic. Set is highly significant to the balance of Chaos and Order in the Universe, and rules all the shadowy places of the cosmos with legions at his command. Vassago is the angelic ruler of all forms of divination including through scrying, crystal balls, pendulums, and runes, but is the particular spirit that rules the Tarot deck. A powerful Prince, Vassago may produce initiatory impulses through use of the tarot that may open hidden paths to those willing to following his promptings. Vassago can be evoked through the use of the scrying mirror where he will appear as a dark-robed, wind-blown spirit, similar to the pilgrim-hermit of the Tarot deck, at once angelic but burning with the black flame of the demonic. He communicates with the magician through imagery and it is essential that the magician “learn to see” in order to understand Vassago’s revelations, but unlike other demons, Vassago cannot tell a lie, he is bound to reveal only the truth. Nevertheless, this does not suggest that the magician should trust Vassago and all precautions such as the properly formed circle and triangle of manifestation, and the proper ritual invocations, should be followed absolutely to the letter for the full protection of the magician. Vepar is the Forty-second Spirit of Solomon and as such is a Great Duke governing 24 legions of infernal spirits. Vepar appears in the form of a female mermaid; he governs waters where he can cause storms and has a particular affinity for battleships, which he vigorously protects at sea. In an esoteric sense, Vepar is connected to Leviathan, the great ruler of the Abyss, and because of this connection Vepar must be met on path of Leviathanic initiation. Through his connection with water, Vepar rules over the subconscious and often appears in dreams as a grey mermaid with opaque blue or black eyes, guiding the initiate. Vepar can also cause death upon command of the practitioner, usually with festering sores and open wounds. In the Persian tradition, Zairich is a demon that teaches the use of herbs, of cunning and poisoning, and of devouring the astral body of one’s enemies through dreams and the inherent instability of the target under attack. Invoke Zairich against an enemy and they will slowly perish by their own bad choices and weaknesses. Zairich is a vampyric spirit who hungers for the life force of those who drink from the “earthly wells” which he is sworn to poison. A destroyer with no remorse, take care in calling up this cunning spirit.